Finally, an inanimate object that understands you! Sometimes all it takes is a little positive reinforcement to help you make it through the day. 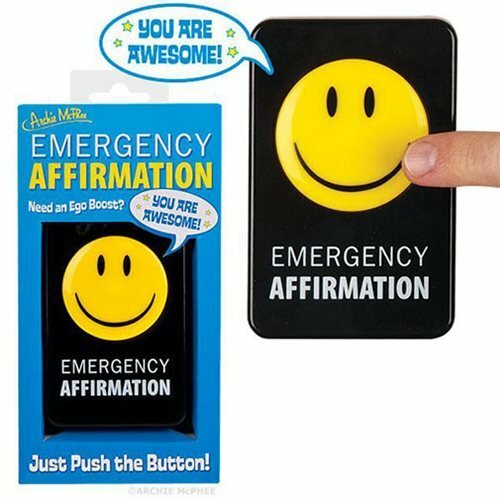 So next time you do something excellent (yet again) and no one seems to recognize it (yet again), just press this Emergency Affirmation Button and you'll hear an enthusiastic "You are awesome!" Ahhh, now doesn't that feel better? Each 4 1/4-Inches x 2 3/4-Inches x 3/4-Inch plastic device has a hole in the back so you can hang it on a wall. Requires 2x "AAA" batteries (not included). Illustrated box with clear acetate lid.